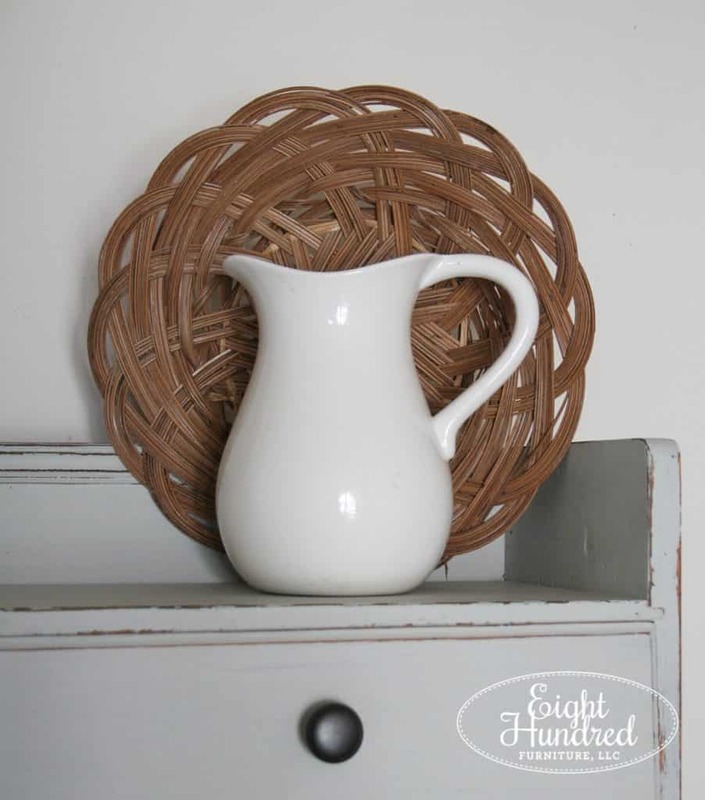 I knew this piece would look absolutely beautiful wearing Miss Mustard Seed’s Milk Paint the first time I laid eyes on it. 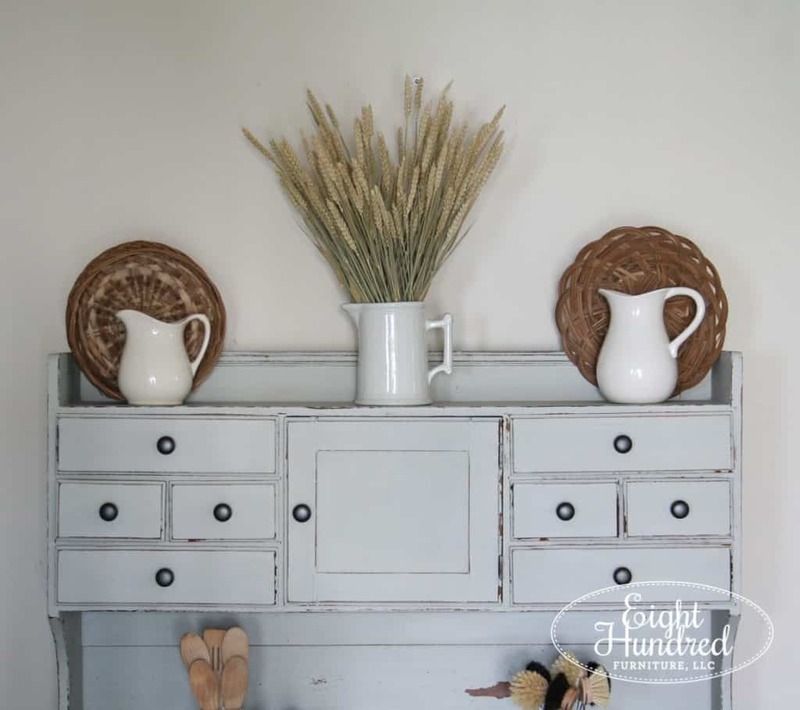 I was working at Morgantown Market and this amazing farmhouse style hutch cabinet had arrived in the booth near the checkout counter. As soon as I saw it, I “oooh’d” and “aaah’d” for a solid 15 minutes while I contemplated whether I should make it over. After some helpful advice from my fellow merchants and the owner of the co-op, my business card was swiped and this piece was loaded up in The Marshmallow, ready for its new look. See? I don’t just sell at Morgantown Market. I’m a good customer too! This piece had worn green paint at some point in its life. If you open the drawers, there are still remnant swatches of the original color here and there. It’s even on the back of the bottom piece. 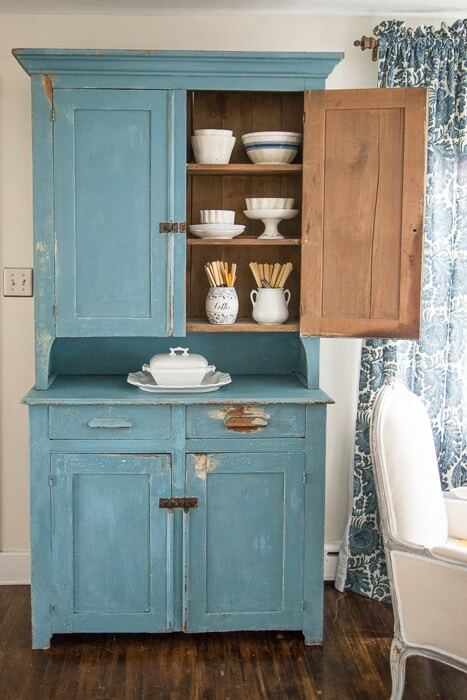 At some point, this hutch was stripped and it was back to the raw wood stage. 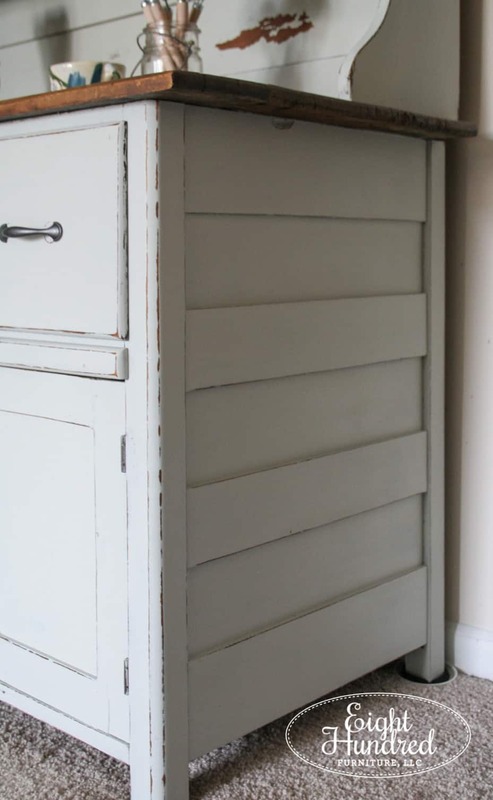 As I sat and pondered what color it should be painted, I scrolled through some ofMiss Mustard Seed‘s fabulous hutches and cupboards for inspiration. 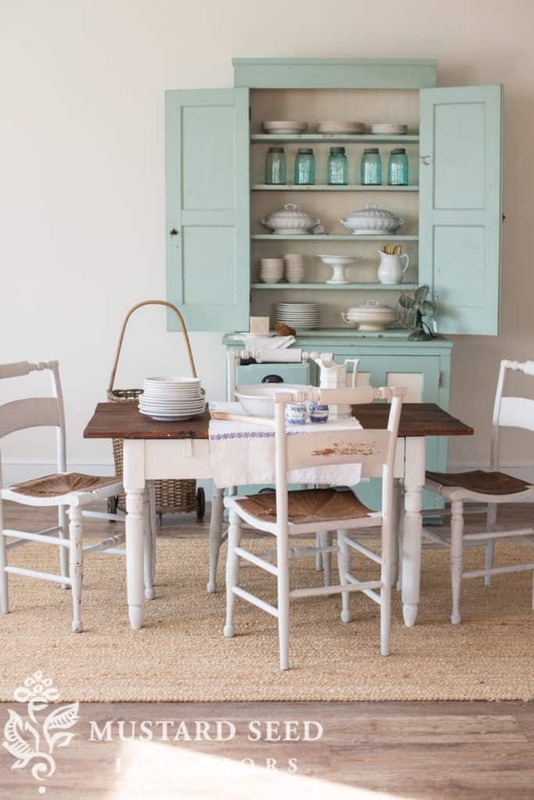 How about the bright and cheery aqua color of Eulalie’s Sky? 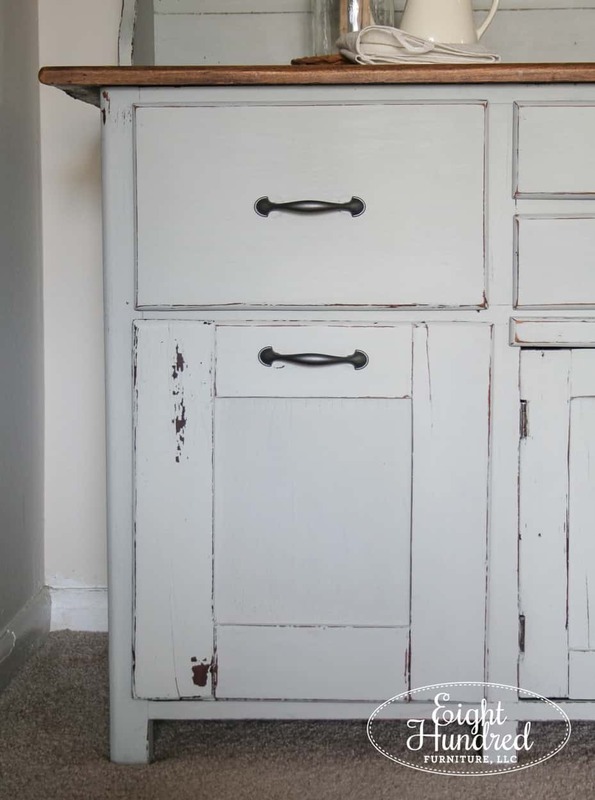 Even though this hutch was child-sized, I thought the fresh white color was adorable! Perhaps this would be the winning look? Or, should I go bold and do French Enamel? In the end, I decided to go with a 50/50 mixture of Grain Sack and Mora. 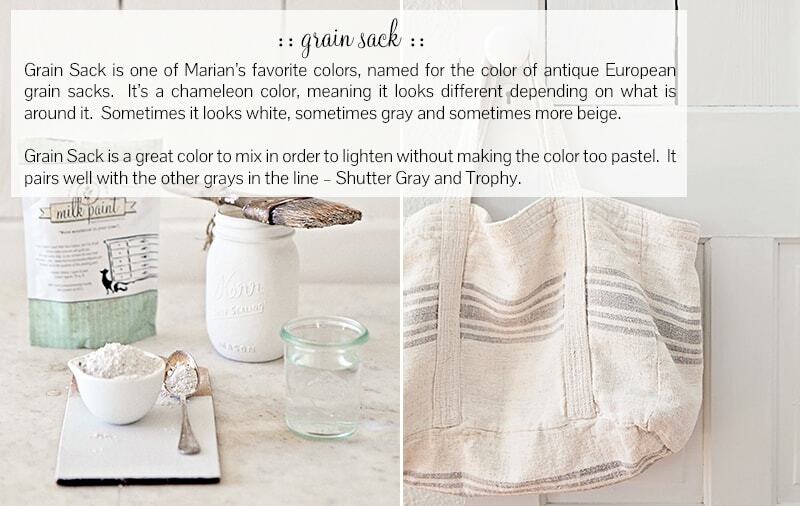 I wanted the muted tone of Grain Sack with a bit of the soft blue/green of Mora to come through. Both of these colors are beautiful by themselves, so I really couldn’t go wrong with mixing them together. 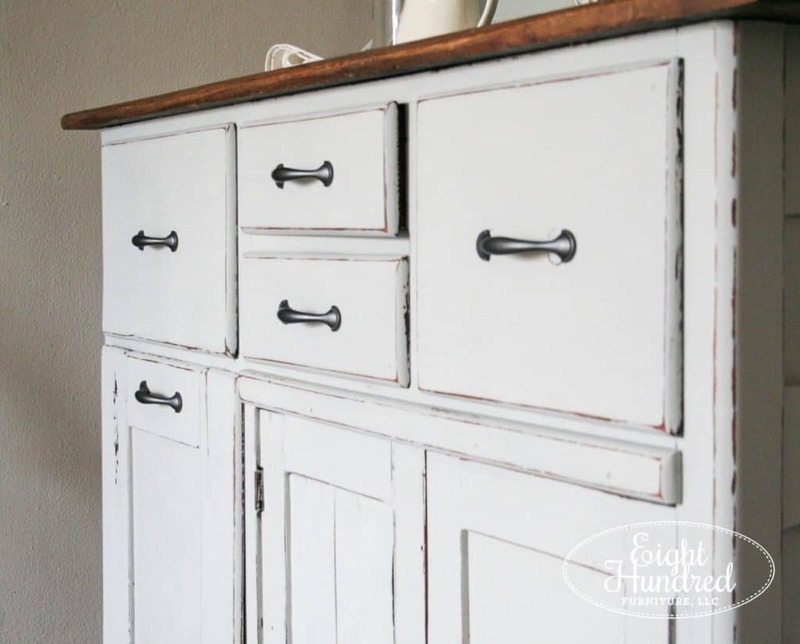 The hutch took two full coats of MMS Milk Paint and I touched up some spots with a third. 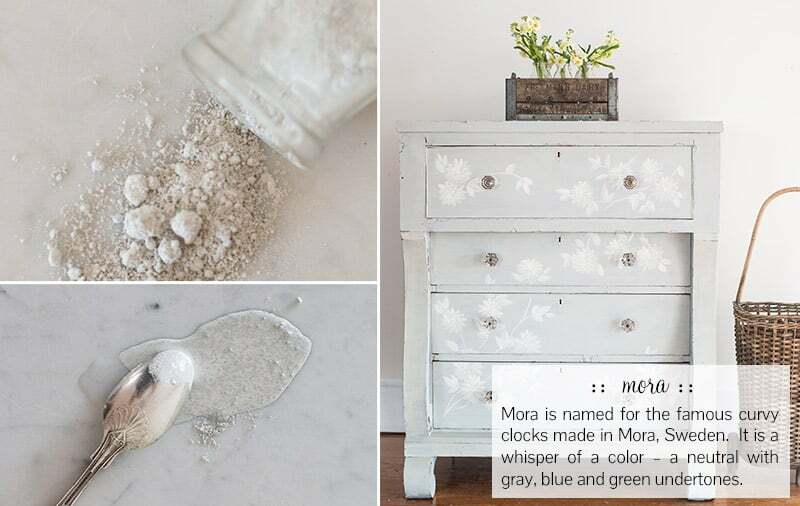 Milk Paint did its thing and chipped randomly as I distressed. 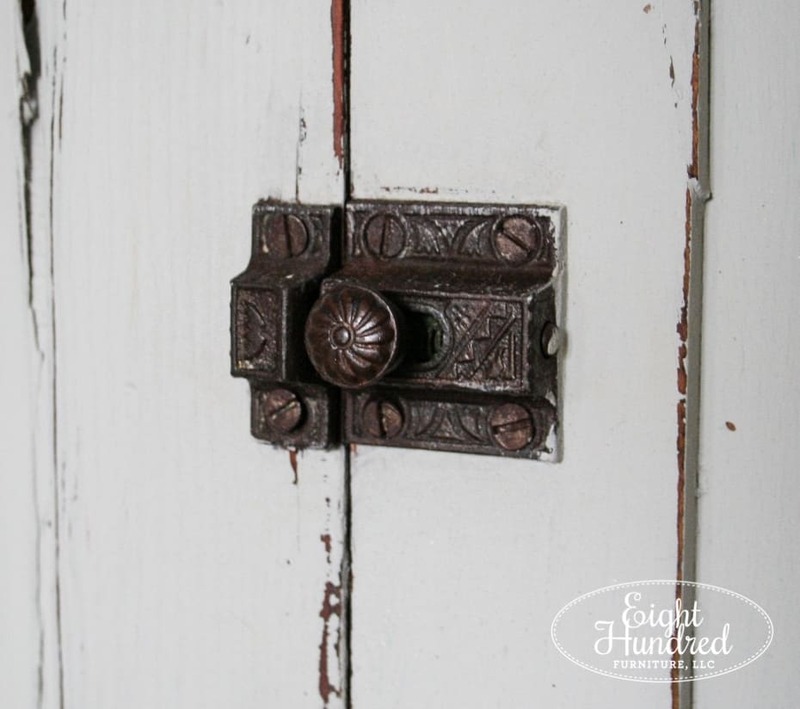 After a coat of Hemp Oil and some new hardware, the hutch had gone from dark and heavy to light and airy. Doesn’t it look so much better now? 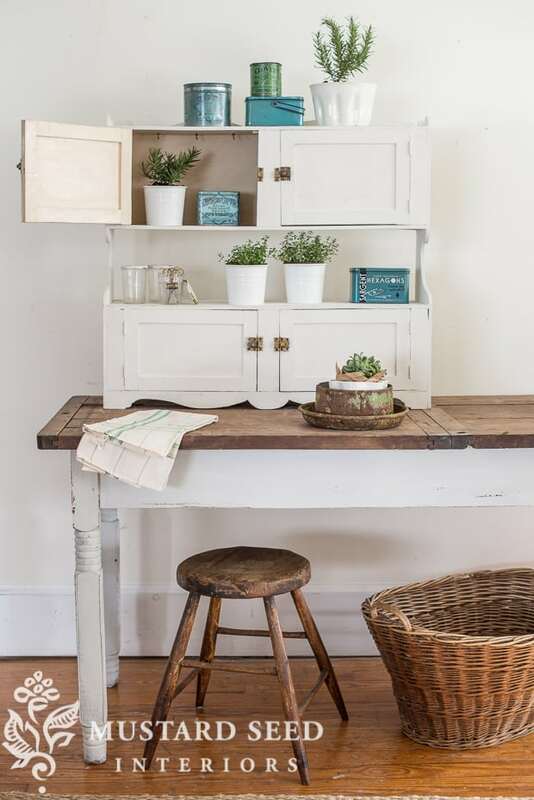 I just love all of the tiny drawers on the top. 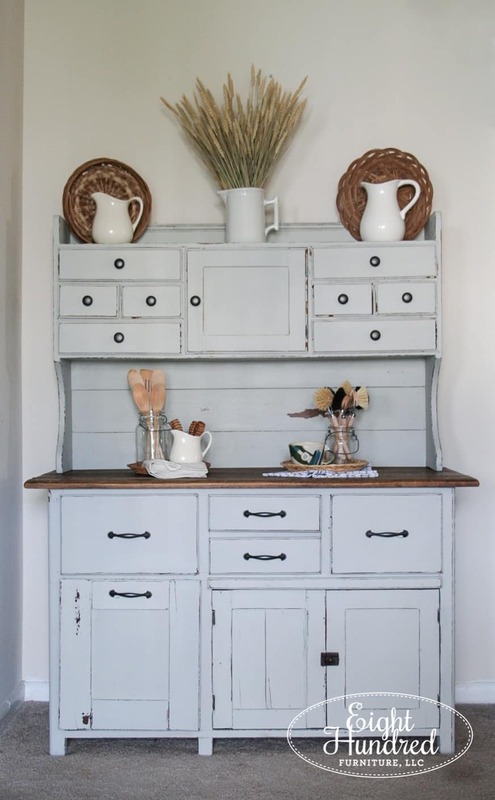 This hutch was definitely hand-made. It’s not a mass produced piece and it’s truly one of a kind. It’s actually just a hair taller than I am at 5 ft. 5 in., so you can see inside the very tippy top drawers. Average-sized people, rejoice! The bottom left drawer is a deep storage bin. If you pull it out, it’s shaped to hold flour or sugar. It’s not lined with metal, so I don’t recommend using it for that purpose now, but I imagine it held those types of things in the past. 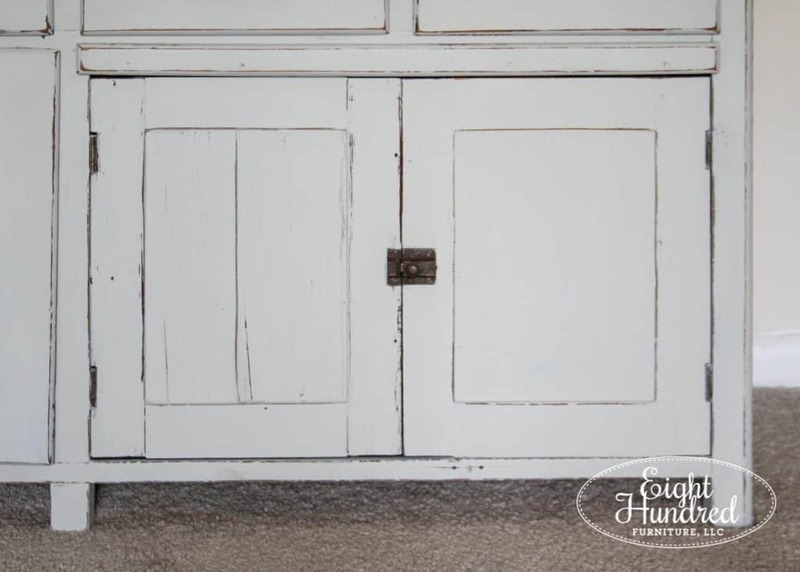 The bottom doors open up to reveal even more storage space underneath the hutch. There isn’t a shelf inside, but you could store pitchers, large platters or whatever else your little heart desires. The left door panel was starting to peel up, but I left it as it was. I wanted to preserve every inch of character. The original latch is the only piece of hardware I saved. Well, that and the hinges. Everything else was replaced with simple pulls and knobs. The hardware it came with didn’t quite match the piece and it was also incomplete. 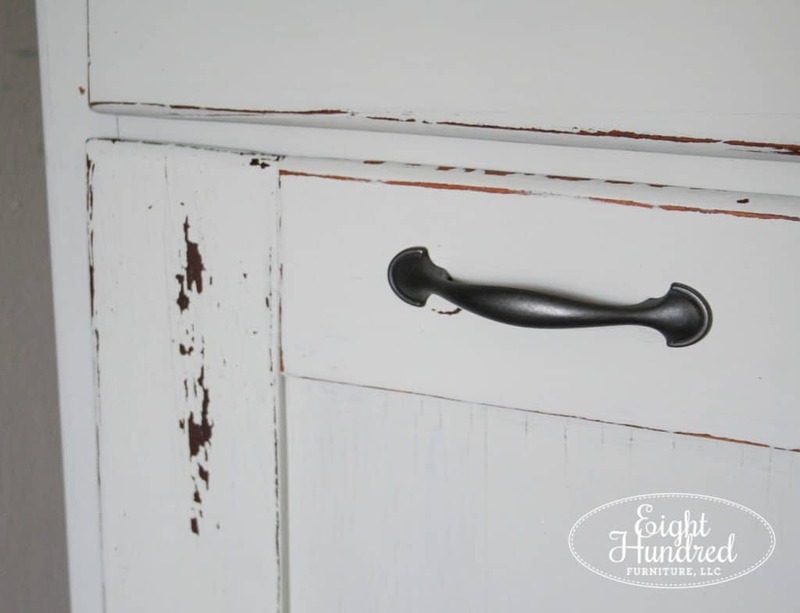 The bail pulls on the drawers have circular back plates that gouged holes in the drawer fronts over time. They aren’t quite covered up with the new handles, but I wasn’t going to nit-pick over that detail. You can kind of see one of the circles on the far right drawer. 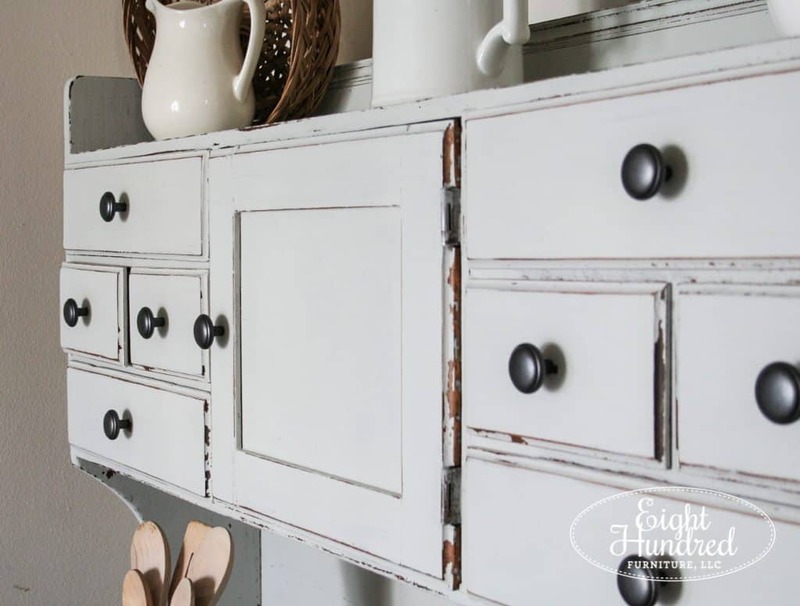 I kept the knobs simple on the top, since there are so many of them – 9 to be exact! I set up little vignettes in the middle using some random smalls I had in my stash. 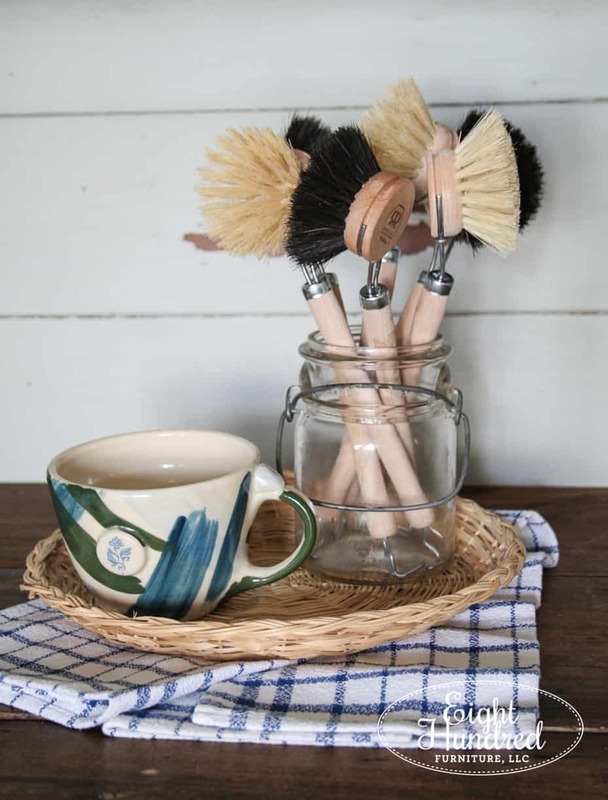 Some German dish brushes and my Miss Mustard Seed coffee cup from White Peach Pottery were nestled together on a basket and a blue windowpane kitchen towel. The colors from the cup and towel work well together, don’t you think? 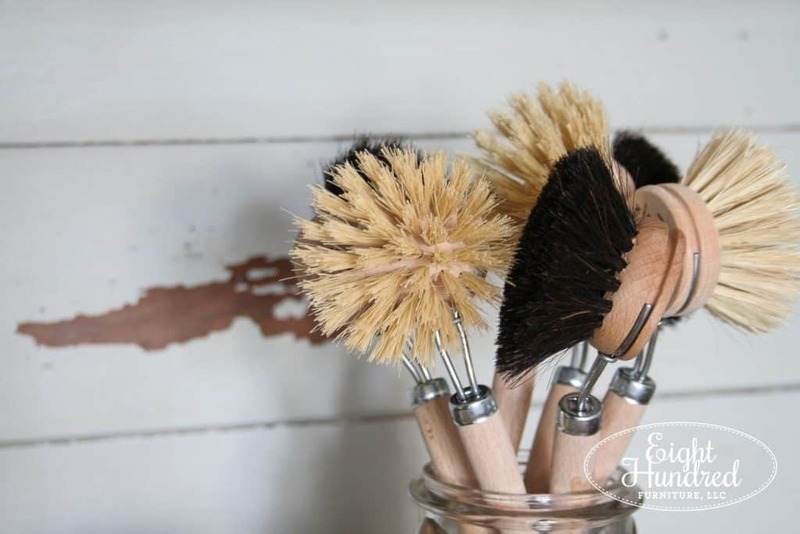 My German dish brushes are so photogenic. Those bristles are simply lovely and quite practical! 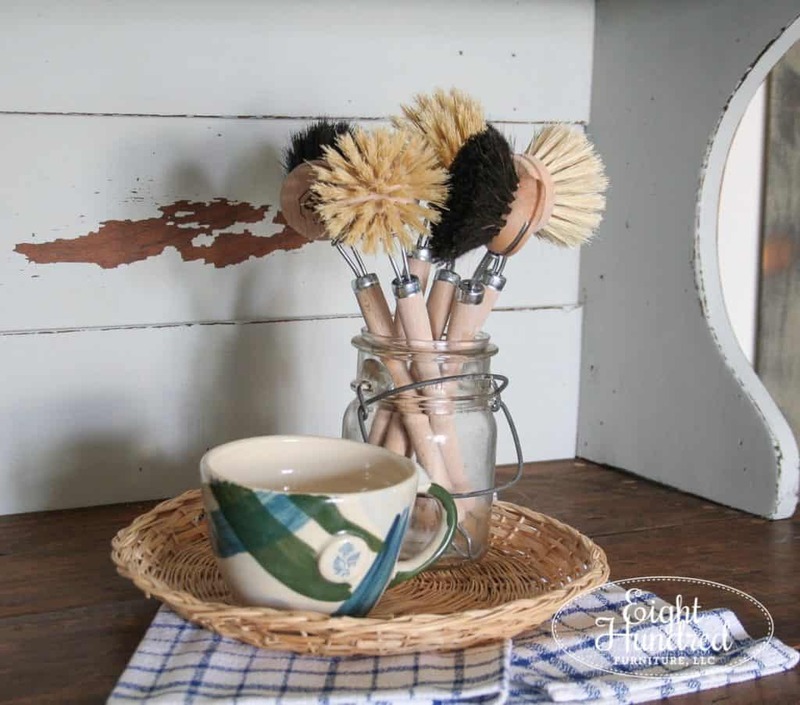 I use these to clean my paint brushes, mixing cups, and of course, our dishes! I have one designated for paint only and a second just for our dishes. 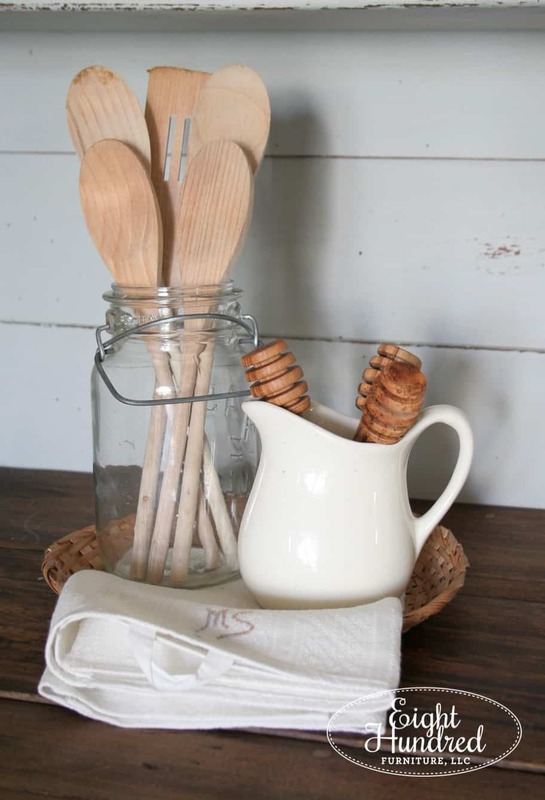 On the other side, I took some of my wooden kitchen utensils and gathered them together on top of a similar basket. Underneath, I folded a monogramed kitchen towel with soft pink stitching. 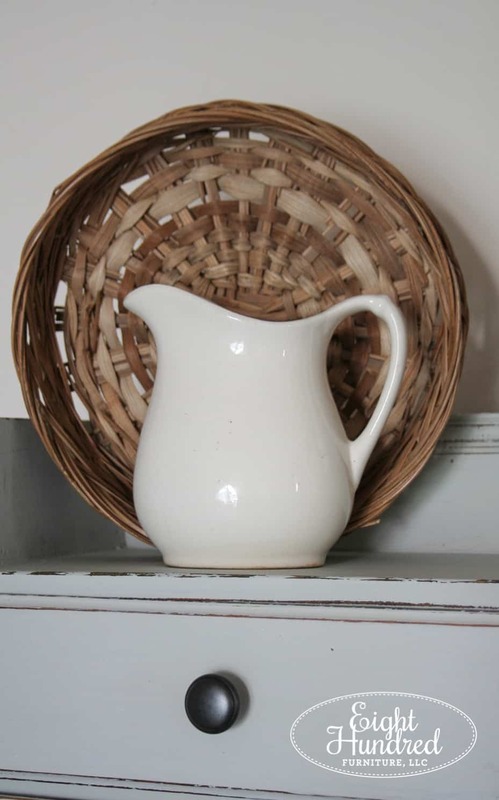 Since this hutch is on the shorter side, I wanted to add height along the top with some more baskets and a trio of ironstone pitchers. 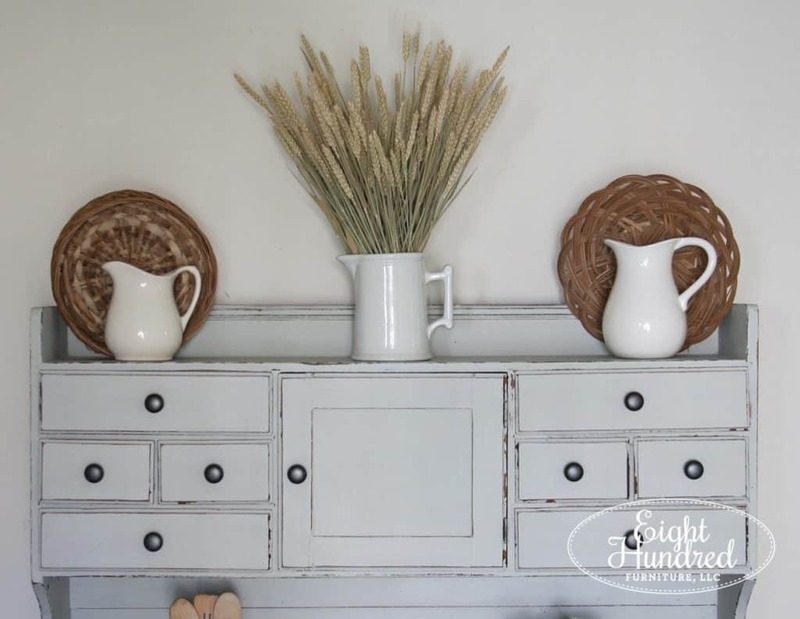 This bundle of wheat stalks will be making its appearance all throughout my Fall furniture projects. I think they look so pretty all together. My cat, Jake, does too, so I have to be quick about using them to stage. Otherwise, he’ll nibble on them all day long. This little basket is my favorite. There’s something about its weave that makes me happy! 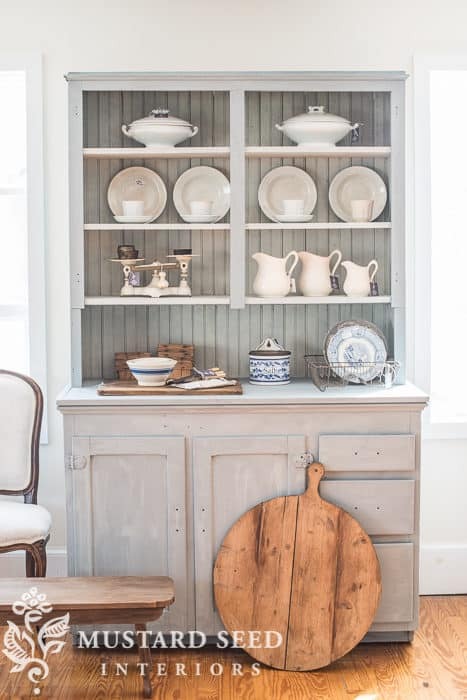 The sides of the hutch bottom are paneled and gorgeous. Can you spy the furniture slider disc that I forgot to remove in the back? I swear by these things and they keep my back from doing too much work as I shuffle pieces around the apartment. We have a small hoard…ahem…collection of them on hand at all times. 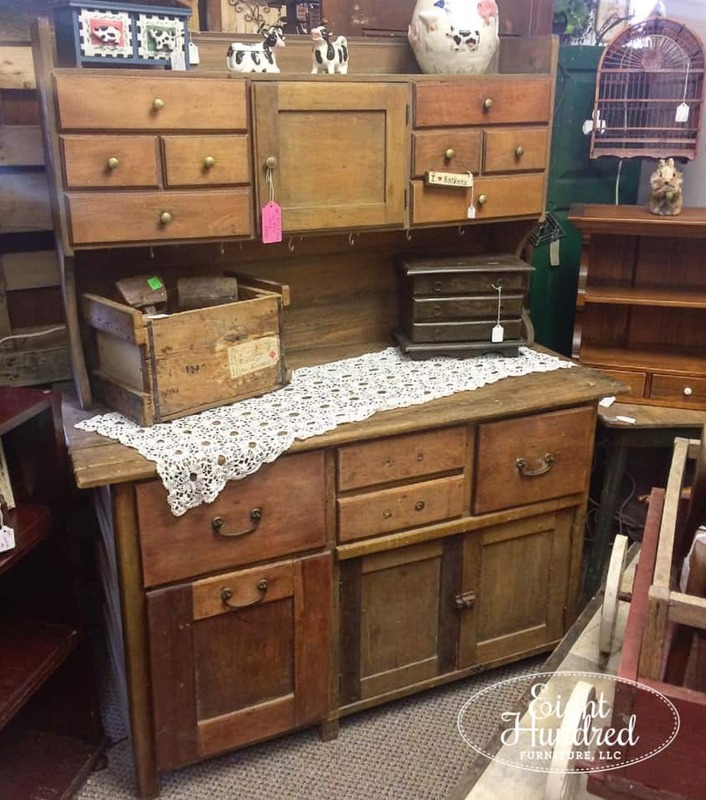 This piece would make a lovely coffee/wine bar. Imagine storing all of your k-cups and wine stoppers in the tiny drawers. Your coffee mugs could be lined up along the top ledge and there’s plenty of clearance for a Keurig machine in the middle. The lower left bin drawer could hold trash and voila! Instant beverage station! Believe it or not, I actually contemplated staging it for this purpose. Marc and I delivered this piece to Painted Table Designs around midday today. The shop is closed on Sundays, so it was an ideal time to bring it in and move things around. It’s ready to go and is priced at $615 if you’re interested. I’ll be in the shop tomorrow at noon if you’d like to visit and see it in person! Keep an eye out on my Instagram feed for more photos and stories on this piece as well.